Now you'll open the start file and begin the lesson by working with the image as you learn about the Layers palette and layer options. The Layers palette displays all layers with the layer names and thumbnails of the images on each layer. You can use the Layers palette to hide, view, reposition, delete, rename, and merge layers. The thumbnails are automatically updated as you edit the layers. 1 Choose File > Open, and open the file 05Start.psd from the Lessons/Lesson05 folder on your hard drive. 2 If the Layers palette does not already appear in the work area, choose Window > Layers. There are three items listed in the Layers palette: first Statue, then Doorway, and finally Background. The Background layer is highlighted, indicating that it is the active layer. 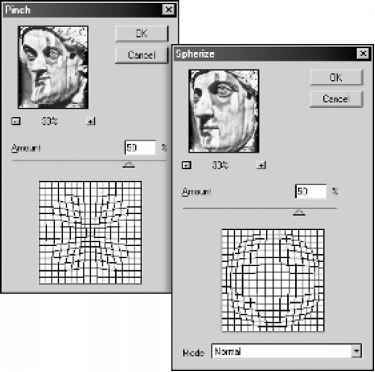 There are three icons on the Background layer: a lock icon (^) on the right side of the layer listing, an eye icon (- ), and a paintbrush icon (.■'). None of these appear on the other two layers. 3 Choose File > Open, and open the Door.psd file in the Lesson05 folder. The Layers palette changes, now displaying the layers for the Door.psd file because it is the active image window. There is only one layer in the Door.psd image: Layer 1. When you create a new image with a white background or a colored background, the bottommost image in the Layers palette is named Background. An image can have only one background. You cannot change the stacking order of a background, its blending mode, or its opacity. However, you can convert a background to a regular layer. When you create a new image with transparent content, the image does not have a background layer. The bottommost layer is not constrained like the background layer; you can move it anywhere in the Layers palette, and change its opacity and blending mode. 1. Double-click Background in the Layers palette, or choose Layer > New > Layer From Background. 2. Set layer options as desired. 1. Select a layer in the Layers palette. 2. Choose Layer > New > Background From Layer.